A recent clinical data from doctors at Aster Hospital Dubai confirms the rapid escalation of incidents afflicting younger patients and reminds that prevention should start early before problems develop. DUBAI - October 22, 2018: A clinical data study of 142 Patients, initiated by Aster Hospitals Dubai, observed that a range of heart diseases strikes the younger generation of Indian expatriates in the UAE. Data analysis across people from multiple ethnicities and age groups of South East Asian countries including India, Pakistan, Bangladesh, Sri Lanka and the Philippines are most at risk for developing heart diseases in the prime years of their life. In fact, the disease strikes them almost a decade earlier than their Western counterpart. The observational clinical study was conducted on patients from diverse backgrounds with coronary artery disease (CAD) and had undergone interventional procedures at Aster Hospital’s Cath lab in the last three months. The younger segment of Indian expats living here are increasingly prone to CADs due to a number of reasons, than any other nationalities and they get it earlier now than before, the study revealed. Aster Hospitals, Dubai is a chain of premium hospitals with world-class facilities in the heart of Dubai under Aster DM Healthcare, a leading healthcare provider in the Middle East and India. 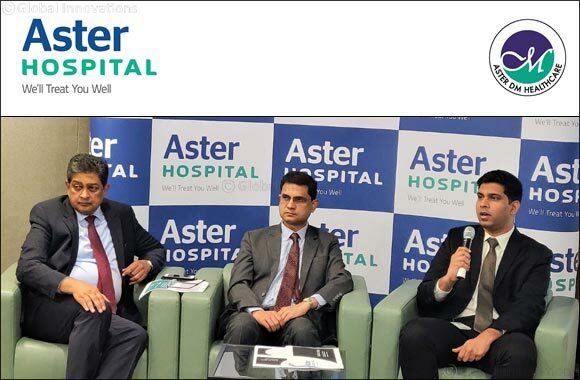 Dr. Sachin Upadhyaya, Specialist Cardiologist, and Dr. Naveed Ahmed, Specialist Interventional Cardiologist from Aster Hospitals, who worked behind the real-time clinical data from the Cath lab procedure presented their observations at a press conference in Dubai. “Many surveys conducted in India indicated that 40 per cent of the people suffering from heart attack are under the age of 55. But the figures are even more alarming for Indian expats living in UAE as there is a steep rise in the numbers with two-thirds of the total number of patients. About 106 patients out of 142 people in the data analysed were under 55 years. This trend is indeed alarming,” he cited. “In the study, we reviewed cases of nearly 142 patients who underwent surgical intervention at Aster Hospital due to CAD. About 57 per cent of them were in the age group of 45 to 60 years, followed by 31.7 per cent aged less than 45 years, 11.3 per cent belonging to the age group above 61 years and nearly 74.6 per cent were less than 55 years. Patients from India and its neighbouring countries like Pakistan and Bangladesh alone represented 88 per cent of the patients,” he added. Out of the total patients, 66.2 per cent were Indians, while 14.1 per cent were Pakistan nationals. The other nationalities included expats from Bangladesh, Philippines, UK and Egypt, Sri Lanka, Nepal, Nigeria and Serbia. “At all ages, hypertension is the most powerful single contributor to the CAD with 43 per cent of the patients in the study. While diabetes mellitus stands second for the disease among 39 per cent of the patients. Smoking proved to be another major cause with 20 per cent of patients being smokers and 3 per cent ex-smokers,” Dr. Upadhyaya elaborated. “When it comes to the procedures done at our hospital, 47.9 per cent of the patients needed angioplasty, while 6.3 per cent had normal coronaries after getting investigations done. About 24.6 per cent of patients were managed by medical treatments rather than going for surgeries,” Dr. Ahmed concluded.